This stunning PVC Handbag features the amazing Aracnafaria artwork by Anne Stokes on a striking lenticular panel which really brings her artwork to life with a 3D effect! Includes a detachable shoulder strap, and many compartments which ensure this handbag is both beautiful and functional. 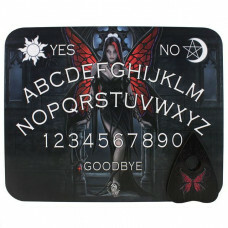 Measures approximately 15" x 12"
An Anne Stokes Spirit Board in an Aracnafaria design. The back of the board features a sentimental p.. This stunning canvas features the Aracnafaria artwork by the amazing Anne Stokes.The canvas is 25x19..
From the Gothic imagination of darkly talented alternative artist Anne Stokes. Standing in a long b..